The image by Željko Heimer and Yosef Obskura is not a current polish CG ensign. It is abandoned ensign of Wojska Ochrony Pogranicza 1945-1990 (WOP - Border Protecting Forces, submitted to Ministry of Defence) In 1990 WOP was tranformed into Straz Graniczna - Frontier and Coast Guard, submitted to Ministry of Internal Affairs. Current polish Coast Guard ensign (pl~cg91.gif), adopted on 20th December 1991 is rectangular (not swallow-tailed). The eagle on COA has crown, as all polish flags since 1990-1991. According to C F Pedersen  page 35, the Flag of the Coast Guard of Poland is as shown. "Coast guard vessels fly the State ensign at stern. Their hull is ornated with an oblique red stripe fimbriated in yellow." If you replace the green border with a white one, and add a thin black fimbriation to isolate the main white field from the border, you get the pilot ensign. Interesting that they kept the green color associated with Coast Guard. Clearly a russian/soviet influence. This a flag of ships of Border Defence Forces (Bandera jednotek plywajacych Wojsk Ochrony Pogranicza; in polish). In times of socialist PPR the flag was same but the eagle was not crowned.Adopted 23 april 1953. 23th April 1953 by State Council. Abandoned when WOP was transformed into civilian Frontier Guard (Straz Graniczna) - 12th October 1990. 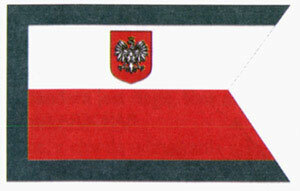 Rectangular and crowned, also with green fimbration - it is flag of Frontier Guard (Straz Graniczna). Established by Minister of Internal Affairs, 20th December 1991. This was the banner of the Polish Navy in 1955, but it was never used.